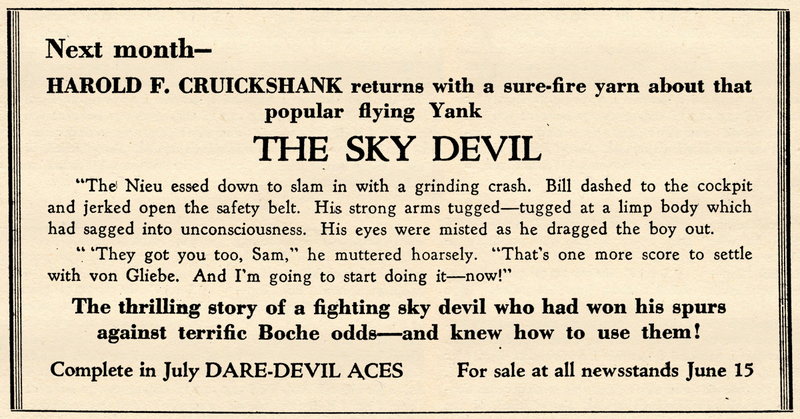 SKY DEVIL flew through the Hell Skies of 29 adventures in the pages of Dare-Devil Aces from 1932-1935. Cruickshank returned to the savior of the Western Front in six subsequent stories several years later. 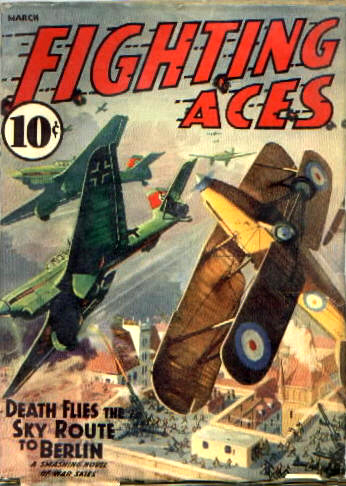 The first two were in the pages of Sky Devils (June 1939) and Fighting Aces (March 1940). The other four ran in Sky Fighters (1943-1946); and like Oppenheim had done with his Three Mosquitoes, so Cruickshank did with Sky Devil—he moved him to the Second World War where Bill Dawe changes his name to get into the air service and flys along side his son! Here we have Sky Devil’s second appearance after his run in Dare-Devil Aces in the premiere issue of Popular’s new air anthology title Fighting Aces! In what is probably an unpublished story found in the files from the original run five years earlier, Bill Dawe—America’s Sky Devil—and his Brood had been ordered to Paris, to take part in a general allied army show that was being put on for the sole purpose of stepping up the morale of the French citizenry. Unfortunately, mock warfare turns into the real thing! Captain Bill Dawe—you’ll like the guy—the way he fights in an open sky, the thrust of his jaw—the beat of his heart inside of his shirt! A fighting eagle brings his brood to rest, and lights the skies of the Western Front with a blazing torch for the damned! For more great tales of Sky Devil and his Brood by Harold F. Cruickshank, check out our new volume of his collected adventures in Sky Devil: Ace of Devils—Nowhere along the Western Front could you find a more feared crew, both in their element and out. The Sky Devil and his Brood could always be counted on to whip Germany’s best Aces, out-scrap entire squadrons of Boche killers, or tackle not one, but two crazed Barons with an Egyptology fetish! But what happens when they find themselves up in a dirigible fighting a fleet of ghost zeppelins, or down in the English Channel battling ferocious deep water beasts, or even behind enemy lines dealing with a crazed Major Petrie? Plenty, and you can read it all here! Pick up your copy today at all the usual outlets—Adventure House, Mike Chomko Books and Amazon!